‘John Wick: Chapter 3’ adds LA Clippers Center Boban Marjanovic!!! | Welcome to Moviz Ark! ‘John Wick: Chapter 3’ adds LA Clippers Center Boban Marjanovic!!! Los Angeles Clippers center Boban Marjanović has joined the cast of John Wick: Chapter 3, multiple sources have told Collider. Representatives for Lionsgate and Marjanović did not immediately respond to requests for comment. Chad Stahelski returns to direct the sure-to-be action-packed sequel, which will feature the Serbian basketball star as an assassin, according to sources. His gigantic hands could end up posing a problem for our badass hero. Marjanović stands an imposing 7 feet, 3 inches, and he previously played for the San Antonio Spurs and the Detroit Pistons. 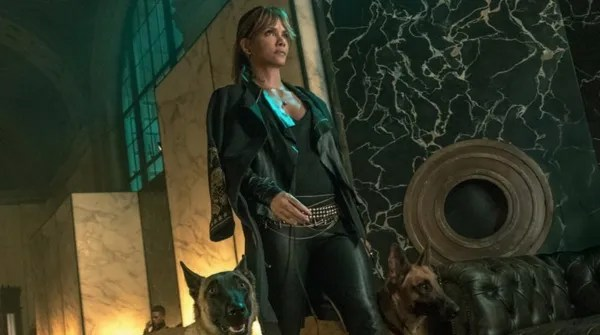 John Wick: Chapter 3 has also added Oscar winner Halle Berry as a new character named Sofia, who’s aided in her mission by two ferocious German Shepherds. Check out a photo of Berry below. Derek Kolstad came back to write the script, which finds John Wick on the run after killing someone in the “safe space” of the Continental Hotel. Now there’s a $14 million dollar open contract on his head, and with his membership revoked, and he has no place to hide in New York City. Lionsgate will release John Wick: Chapter 3 in the midst of next year’s summer movie season on May 17, 2019. ← ‘Hotel Artemis’: New Clip Showcases Charlie Day as Acapulco!!! Check It Out! !